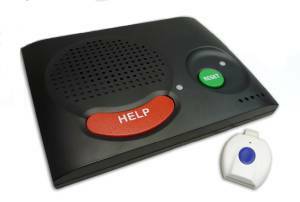 How does a Cellular Medical Alert System Work? Our cellular medical alarm requires no phone line or cell phone and you can use it anywhere. This alarm comes with a Personal Help Button that you wear discretely on your wrist. When the button is pushed, it activates the Personal Emergency Response System and connects you to the Care Center where someone immediately responds to ask if you need help. Once our representatives have determined what help (if any) you need, they will call your responders to get you the assistance you need. By using a Personal Emergency Response System you have the freedom to call us day or night, even if it’s just to say that you are doing fine. Our Care Center will call you once a month to ensure you are secure.